Click here to return to the properties list. Great Retail in Heartside District! The Heartside District is seeing significant new development that has rejuvenated the neighborhood. 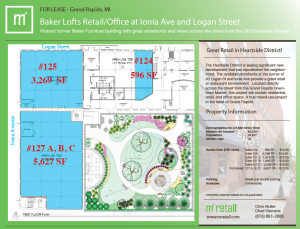 The available storefronts at the corner of 40 Logan St and Ionia Ave provide a great retail or restaurant environment. Located directly across the street from the Grand Rapids Downtown Market, this project will contain residential, retail, and office space. A true mixed-use project in the heart of Grand Rapids. Click here for a full brochure.